The Oklahoma State School Boards Association is the voice of school board members at the Capitol. 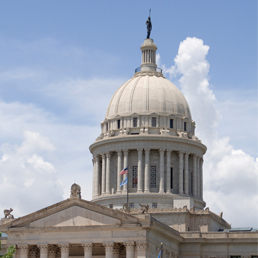 OSSBA initiates and encourages legislation to benefit Oklahoma’s public school students. OSSBA also provides policy and legislation-related information to school board members so that they may informed and effective advocates on behalf of their school district’s students at the Capitol and in their local communities. Rooney Virgin is OSSBA’s Director of Government Affairs and represents OSSBA members at the state Capitol. She sends out a weekly legislative update during the legislative session and action alerts as needed. To receive legislative action alerts via text message, text @ossb to 81010. Develop and implement a long-term funding plan bringing the state per pupil expenditures to the regional average, to equip schools with the tools and resources to improve student achievement and produce college- and career-ready students. Support efforts to assess and alter all tax incentives and state revenue streams to ensure the state budget provides adequate funding for public schools. 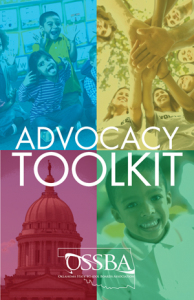 Support equitable reporting and accountability mechanisms for all educational institutions that receive taxpayer dollars and/or benefit directly or indirectly from tax incentives. Create a separate funding formula that adequately and fairly supports virtual learning for students. Work with the state Department of Education to ensure implementation of an accountability system that includes multiple researched-based indicators of student growth and school effectiveness. Reauthorize the Carl D. Perkins Career and Technical Education Act to expand opportunities for college and career readiness. Ensure the United States Department of Education rules and regulations retain flexibility and local control provided for under the Every Student Succeeds Act. Protect federal funding for education, including Medicare/ Medicaid. See the 2018 OSSBA Legislative Review here. The OSSBA Legislative Goals make the OSSBA’s Legislative Agenda for the upcoming year and also set the OSSBA policy. These goals and statements are voted on during our annual summer conference at Delegate Assembly by school board members. These particular goals and statements were adopted on August 25, 2018. These goals are formed using submissions made by school board members to the Government Relations Committee of the OSSBA, who then present them at Delegate Assembly for adoption. These statements and goals serve as a reference for you as a school board member to know what OSSBA stands for, as well as serves as a roadmap for your OSSBA staff in their work every day for school boards at the OSSBA.